Hexbrowser is a tool that can identify more than 1000 different file formats, by looking for signatures inside the files. HexBrowser is freeware. The latest version is v0.72 (march 2014). It is made by Peter Fiskerstrand. HexBrowser works on all Windows versions that can run .NET 2.0. HexBrowser MFC v1.5.71 You'll need mfc71.dll and msvcr71.dll in your system32-folder to use the old HexBrowser. Shows the content of cab files. 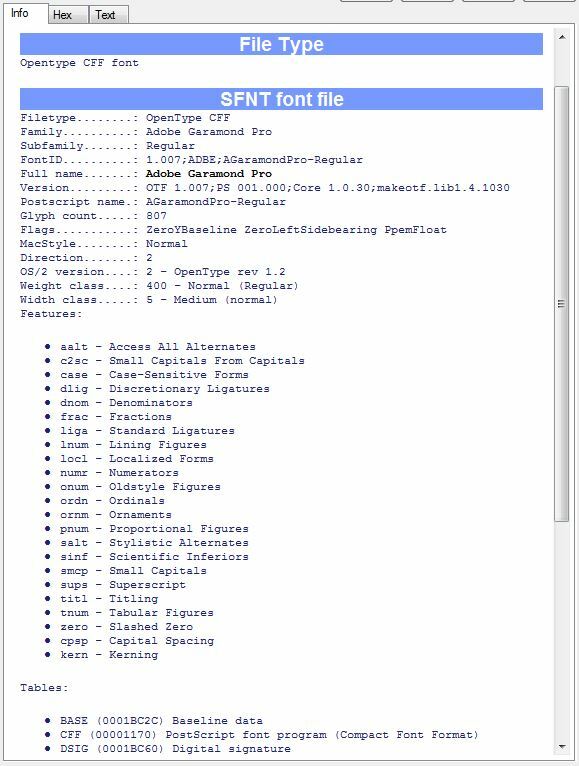 Lists font names inside TTC true type collections. 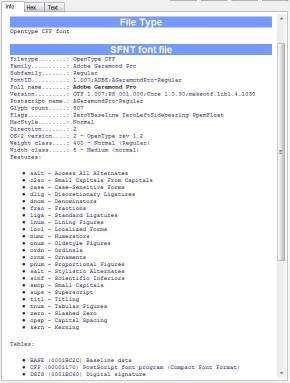 Metadata for OpenType, TrueType and WOFF font files. Integration with MediaInfoLib: HexBrowser now shows details for audio and video files. Better support and new signatures for MSI,OLE2,XML,BIFF,PCAP. HexBrowser is a tool that identifies file types. It does not care about the file extension, but opens each file to look for signatures inside, so it can determine the exact type of a file. It now recognizes more than 1000 different file formats. 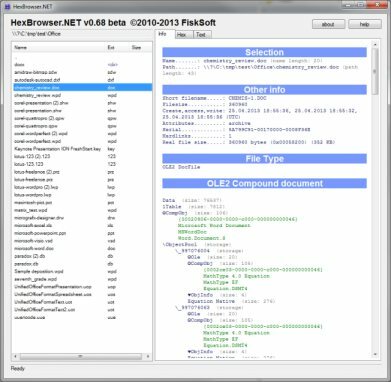 HexBrowser shows detailed information about each file, or a hex- or text dump of the beginning of each file. For the sake of speed, only the first 12 KB of the file is shown. 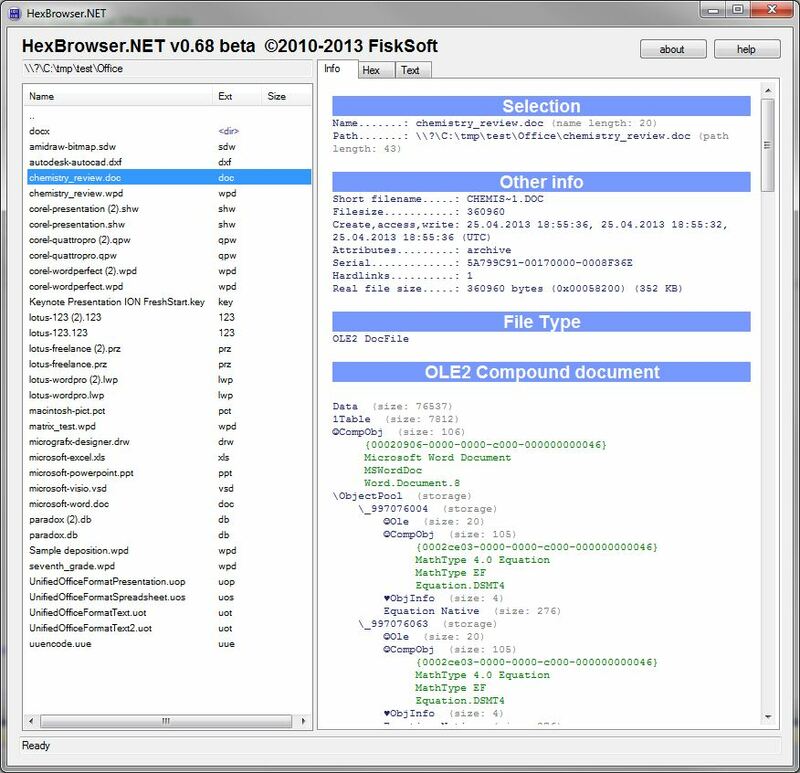 HexBrowser also shows extended information about some of the file types. Browse through files and folders by using the enter, backspace and arrow keys. HexBrowser can be started with a file or directory path as parameter. Files can also be dragged and dropped onto the left pane of the HexBrowser window. If you put a link to HexBrowser in your SendTo-folder, you can send files to HexBrowser from the Windows Explorer. Read the FAQ for more info.